This IS interesting indeed. 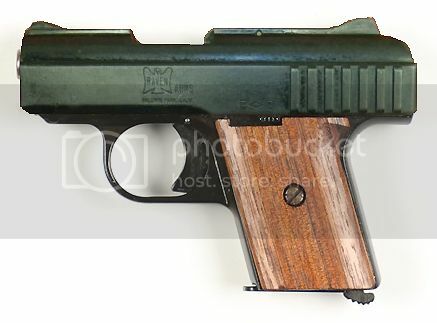 It would have to be a very late Baldwin Park pistol, I had suspected that the change took place when Raven had to retool after the change of facility to Industry. Alternately, maybe there were some surviving parts left over from Baldwin Park that were used to get Industry production up and going, I suspect markings were added to components after they were more or less finished. Something else I'll have to keep an eye out for. Here is a mock-up of what I suspect the 2nd variation from Baldwin Park should look like. The safety should be the early curved variation of the small slider because those were used into the 400,000 serial number range. These 2nd variation Baldwin Parks should fall somewhere between 45296 (the highest 1st variation Baldwin Park I've observed) and 98530 (the lowest Industry P-25 I've observed), although I'm sure that range can be narrowed down further once more early Raven examples are reserved, but that's what I've got from my data at this point. That's a wonderful find, and I apologize for my very late update. It's a great kit, but the problem with assembling it will be that the frame is very different from both the earlier button safety models and that of the later non-Baldwin slide safeties. I've _Got_ to get some documentation up.